Borderlinx | Buy Longchamp and ship worldwide with Borderlinx. Cheap rates guaranteed. A family owned company, Longchamp has been offering timeless luxury leather goods and canvas handbags since 1948. Named after a racetrack in the outskirts of Paris, the brand has been developing a line of luggage, wallets and handbags. In 1993, Longchamp came out with a brilliant concept called Le Pliage: a nylon fabric tote bag folding so that it can be stored flat. The bag's simple shape and wide choice of colors made it a instant hit worldwide. Today, Longchamp offers a range of clothing and shoes for women and the Pliage bag is even accessible in a all-leather version. 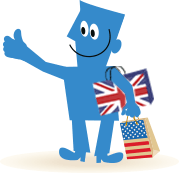 International customers can nowbuy Longchamp USA with Borderlinx today! Borderlinx will ship your Longchamp order right to your home, and our Shipping cost calculator determines your cheap shipping, tax & duties upfront! A number of services are available through Borderlinx to make international ordering from Longchamp USA hassle-free, including concierge, free repacking and consolidation services.